Aren't all Kindle Bibles single column? I feel like that particular part of the description may have been taken from the description of a print Bible...say, the Catholic edition NRSV which is single-column in prose books, double column in poetry books, and does indeed have woodcuts at the beginning of each book. 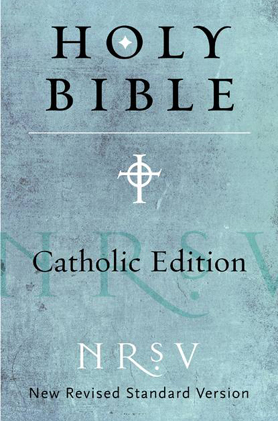 I had mentioned this Kindle Catholic edition in a comment back on this 10/7 post on "Upcoming Catholic Bible Releases". There are NRSVs without Deuterocanons and NRSVs with full Extended Apocryphas coming out next week. This is significant because previously Harper releases had separate Old Testament and New Testament purchases required and had poor internal navigation. The books are indeed linked with bonded leather volumes and one hopes that they do not include wood-cuts (that would cause problem on the Kindle which uses re-sizable fonts). Similarly, a concordance is less desirable in a Kindle which already has a word search feature built-in. I would like to say that for E-books on smart phones and tablets, my preferred program is OliveTree which features a huge number of Bibles (including original language, NRSV, NABRE, RSV, old NAB, Oxford Catholic Study Bible, etc.) and Bible aids. Thanks for the Olive Tree info. I will indeed look into that for my I-Phone. Here is the Nook NRSV featured above.